The Palm Zire 71 is Palm's latest consumer model with an emphasis on multimedia. The Zire 71 sets itself apart with its bright and crisp screen, built in digital camera, and blue casing all at a wallet friendly price tag. 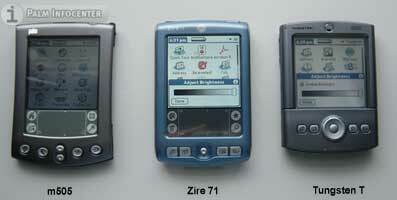 At first glance, the Zire 71 looks much like a traditional Palm OS handheld. The Zire 71 has plastic blue case, with a subtle sparkle and a plastic silver back. It includes a new small joystick like 5-way navigator and four good sized application buttons. The sides of the device are smooth and clean, but can get a bit slippery especially if you have a case of sweaty palms. There is a small speaker in the rear and a SD slot, IR window, headphone jack, stylus silo and power button at the top. The Palm Universal connector is on the bottom. The new 5-way navigator is a small joystick like nob, similar to the one found on the Sony-Ericsson t68. It's like a mini joystick of sorts. It works well for general navigation and scrolling through apps and the datebook, however it took a little bit of getting used to for some games. Because it's so small it is a little bit clumsy for some situations that require precision movement in games. (But thats not the main use for PDAs, right?) It's also sometimes hard to push in on the joystick without triggering up or another direction at the same time. I much prefer the d-pad of the Tungsten series. The Zire 71's main feature is cleverly concealed by a hidden sliding section. With a push up on the slider the blue portion of the handheld rises to expose the camera lens on the back and the dedicated shutter button in front. The slider both protects the camera lens and acts as an activator that launches the camera app for a quick picture. Its dimensions closed are 4.5 in. x 2.9 in. x 0.67 in. (114 x 74 x 17 mm). The 71 weighs a pocket friendly 5.3 oz (150 g). The build quality is solid with no creaks or rattling loose parts. However, Palm loses a few points for using a silver paint that is a magnet for smudges and fingerprints. The included stylus is a solid black and plastic. It is a decent thickness and weight. However, a major oversight is the lack of a reset pin of any kind. Looks like we're back to the days of relying on a trusty paperclip. The Zire 71 uses a 144MHz Texas Instruments OMAP310 (ARM) processor. It includes 16MB of internal memory of which, 13MB is user accessible. The processor is very snappy and applications run fast and smooth. In fact some processor intensive games, such as Sonic the Hedgehog, seem to run a bit smoother on the Zire 7, compared to the tungsten T.. The display is a bright transflective TFT color display. It is a square 320x320 pixel screen with supports over 65,000 colors. The display is stunningly is gorgeous and quite vivid. It is very bright display, even at lower brightness levels. The colors are accurate with excellent contrast and viewing angles. It's very hard to judge or capture the quality of a handheld display through the pictures, it is something you must see in person to really appreciate. The display is easily one of the best I've used on any handheld. The screen is viewable from nearly all angles and is consistently backlit without any shadows or bright spots. It has an on-screen slider to set the backlight brightness. The screen fades and loses a little bit of it's vividness in direct sunlight, but is still very useable. The default font that palm uses for Palm OS 5 is one of the nicest and more legible fonts on any handheld. For audio, the Zire 71 has a true speaker mounted on the lower left back of the handheld with a 3x2 grid of speaker holes. Palm placed the speaker in a bad position, as it is very easy to cover the holes and muff the sound when holding the handheld. It provides decently loud volume for alarms and system sounds, though if you're a deep sleeper forget about it getting you out of bed. MP3's can be played back over the speaker as well, but most will opt for using the stereo headphone jack (it does not come with headphone). The Software essentials CD contains the free RealOne audio player and there are a number of third party programs for digital audio as well. For the first time, Palm has replaced the standard Palm OS system beeps and chirps with a new set of much nicer and modern sounding system alerts. For instance, instead of a monotone beep when you insert a SD card, a richer sounding alert is played. This is a nice touch and something I think Palm should continue to implement on new models. Even with the updated audio and speaker, Palm is still using the same datebook alarm sounds that debuted on the Pilot 1000. While there are many third party replacements, these are long, long overdue for an update. The Zire 71's main feature is cleverly concealed by a hidden sliding section. With a push up on the slider the blue portion of the handheld rises to expose the camera lens on the back and the dedicated shutter button in front. The slider both protects the camera lens and acts as an activator that launches the camera app for a quick picture. Palm calls this a slide and shoot design.. The camera can capture images images in three different resolutions: 640x480, 320x240 and 160x120. The CCD has a 300,000 pixel rating, about the same as most expensive camera phones. There are advanced options for setting the white balance (Auto, Fluorescent, indoors and sunlight) a contrast slider and auto brightness. With the screen as your viewfinder pictures are taken with the dedicated shutter button. Pictures take less than a few seconds to save to the handheld or expansion card. The app also shows you how many remaining pictures you can take as well as a battery meter. I'm a little mixed about the quality of the camera. It does a fairly good job for being such a low pixel camera. Sometimes it suprises me with a really quality picture and other times, the focus and soft colors make for a very disappointing image. The software itself does a good job of adjusting to various light conditions. If you're just looking for simple images and photos for emailing and posting on the web they will be just fine. If you always carry your handheld with you, it's great to have the extra ability to capture pictures in what ever situation you find yourself. I've posted a series of unedited pictures in different lighting situations so you can make your own quality judgments. The battery in the Zire 71 is a 900mAh lithum-ion rechargeable. With the backlight set to about 40% the battery life is quite good. Even taking a bunch of photos in succession does not put a big strain on the battery. Recharge time in the included USB HotSync cradle is approximately 2 hours for a fully discharged battery. On caveat is the lack of a LED to show that the handheld is being charged. The Zire 71 has dual expansion, in the form of the Secure Digital (SD) slot and the Palm universal connector on the bottom. It supports both SD and MMC cards and is SDIO compatible for non-memory expansion cards. Strangely, as of this writiing Palm still does not have a Palm OS 5 driver available for the bluetooth SD card. So your options are pretty limited if you would like to use any sort of wireless access with the Zire 71. A few minor things that the Zire 71 lacks but would be a nice addition include a microphone for voice recording, a LED to indicate charging status and vibration alert. I find it a little curious that a multimedia handheld can not record sound clips. Another thing that surprised me was that you can not record short movie clips. This would be a nice touch, however it seems pointless if you don't have a mic to pick up audio. Size & Weight: 4.5 in. x 2.9 in. x 0.67 in. (114 x 74 x 17 mm); 5.3 oz. I have picked up on Graffiti 2 pretty quickly, it is very similar to the original graffiti, with the exception of letters that now require two strokes instead of one (i,k,t, x and 4). Capital letters can now be written in the middle of the silkscreen without having to use the capitalization shift first. There are a variety of third party solutions that allow you to customize the characters or use the old Graffiti system. One of the most useful software features on the 71 is the way the D-stick is integrated to support the one-handed functionality. For starters: with the device off, a short press of the Select button pops up the time and date for a couple of seconds then shuts down, or a double click and the device is on. Holding Select down for two seconds switches to the application launcher screen, and you can use the D-stick to navigate to your application of choice and launch it with another press of Select. In addition to standard Palm OS applications Palm includes, the Kinoma player for movie playback. A simplified version of Kinoma producer for windows is included to create and transfer movie clips to the handheld. The Palm photo app, which is used to display pictures taken with the camera can also import jpeg files from a pc, but can't display images any higher than the native 320x320 resolution. Also included is the World Clock, Notepad, Expense and Phonelink and SMS (only for use with IR phones for now). One the desktop side of things, Palm includes their new Quick Install program for Windows. Quick Install simplifies installing programs and converting documents and photos for handheld use. Users simply drag zip files, prc application files, photos, videos and even MS office files into the app and it will preform the necessary conversion and install the the files on the next hotsync. The photos application is integrated with the Palm Desktop for windows. You can view pictures taken and do some very basic editing and sharing. On Apple systems the photos are saved as jpegs to a folder. The in box software includes: RealOne audio player, Adobe Acrobat, Audible player, powerOne calculator, Kinoma, Palm Reader, Solitare and VersaMail. The Zire 71 is a fun photo centric handheld with a good price and a fantastic screen. It's great to always have a camera with you and even better to catch people off guard with a PDA camera. The Zire 71 combines a great feature set and a stylish design at a mid range price. The Palm Zire 71 can be purchased for $299 from the Palm Store, or you can search for the lowest price on the web with our price comparison shopper.